Fiona Reidy – Djinda Kaal is a Noongar woman of the Bal-ar-dong clan traditionally located in the York and Brookton areas, in the wheat-belt region of Western Australia. Her inspiration to paint developed over time observing the different styles and talents of her family. Fiona’s art is a rhythmic combination of colours and earthy tones. Her technique shows the ability to layer and blend which gives my dot work a kinetic and unique contemporary and sometimes 3 dimensional style. Djinda Kaal is Fiona’s artist name in Noongar meaning 'Star Fire' which her mother chose for her. What inspires Fiona to paint is having a strong connection to country, family and most of all how her ancestors who were hunters and gatherers lived off the land as nomadic people. The depictions in her artwork visually enhances the individual’s senses to connect to her culture, land and the animals. Fiona is the Proprietor and Artist in Residence of the new Aboriginal Art Gallery in the beautiful Swan Valley. 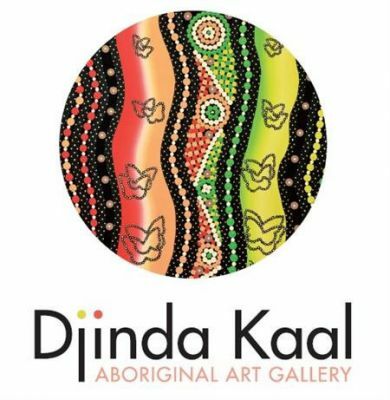 Djinda Kaal Aboriginal Art Gallery is located on 24 Coast Road, West Swan where Fiona displays her beautiful art works and showcases her talent. Click here for more information.